The Place Taking over the space of what was previously Butter Factory, UsQuBa is a brand new Scottish restaurant which debuts this week at One Fullerton. I was clueless about the eccentric name, but it is actually derived from the Gaelic Usquebaugh, meaning Water of Life, or simply, whisky. The elegantly designed restaurant boasts a contemporary European look, offering a panoramic view of the Marina waterfront. The 120-seater restaurant is helmed by Executive Chef Guven Uyanik, serving New Scottish cuisine handcrafted by himself. The Food You can’t miss out on the bar if you are a serious drinker. Expect a well curated whisky list with up to 30 reworked classic cocktails as well as rare and exclusive whiskies, and some of Scotland’s finest craft gins and beers. For a start, we had the Orkney Islands Scallop Ceviche (S$25), beautiful plated with compressed cucumber and apple, horseradish snow and sea urchin. Most of the ingredients used here are from Scotland with a little Asian influences. This dish is pretty Japanese inspired to me, with the pairing of fresh scallop and uni to wake our senses up. I was surprised to see the Seared Foie Gras (S$21) paired with waffle for the first time. Interestingly, the richness and sweetness of the well-seared foie gras blended nicely with the waffle, easily one of my favourite dishes here. For mains, my favourite is easily the Duet of Aberdeen Angus Beef (S$56), the best of both worlds for any beef lover. Served with plum jus, the braised short ribs was literally melt-in-the-mouth, my preferred meat of the two. My only gripe is that the grilled tenderloin was slightly too well done and tough for me. 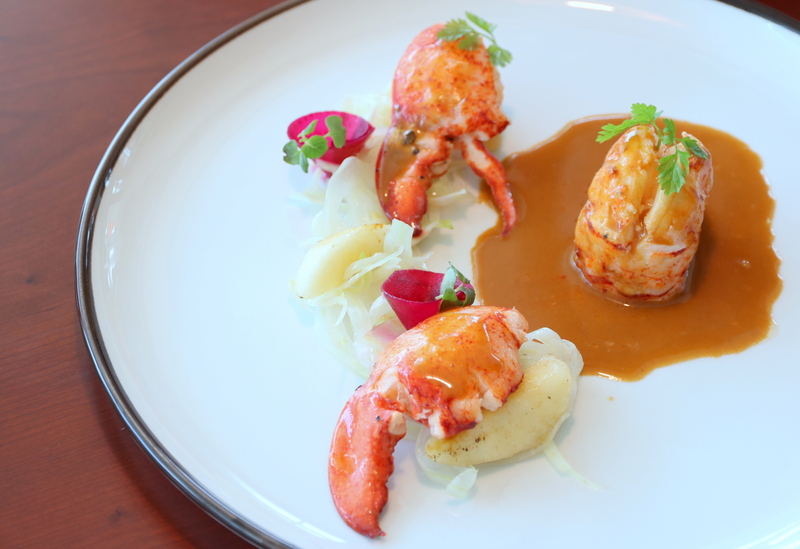 One of the Signature dishes here at UsQuBa is the Butter Poached Lobster (S$58), huge chunks of delish lobster meat accompanied by lobster jus, peaches and beetroot and fennel salad. The presentation was impressive, with the attention to the contrast of vivid colours laid on the plate. The overall flavour of the lobster is a nice natural sweetness which highlights the fresh ingredients and used here. For another taste of the sea, I fancied the UsQuBa Fish and Chips (S$32) featuring sous vide cod with mushy peas and mint and pommes maxim in a beer beurre blanc. I am not a fan of pigeon meat, so it is no surprise that the Baked Pigeon (half for S$32 or whole for S$46) was my least favourite mains here. The pigeon meat was quite tender though, even though there was a tinge of gamy flavour. I thought the pairing with squid ink sauce was interesting, in terms of the added flavour and play of colours. Spot the calamari and green peas puree as well. For desserts, if you can only choose one item, it has to be the Chocolate Delice (S$15), a delightful combination of bailey’s ice cream, mix berries. This dessert was just wow for any chocolate lover, as I was wooed by the rich, dark chocolate with such a solid texture, well balanced by the refreshing berries and milky bailey’s ice cream. Another close alternative is the Tastings of Strawberry (S$15), seemingly created specially for pistachio fans. Expect to spot the crunchy pistachio biscuit within this bowl, alongside with pistachio cream, strawberry juice and strawberry sorbet. Rants Not the most intuitive a restaurant to find. You got to locate the lift that brings you to level two of One Fullerton and walk through the maze at the upper floor. Of course, if you have been a frequent clubber at Butter Factory, then you are probably find the route all too familiar! Will I Return Again? There aren’t many fine Scottish restaurants in Singapore and UsQuBa is a good addition to our diverse culinary scene. It does, however, come with a price tag targeted at those who are willing to splurge on food, with a view of the Singapore’s Marina Bay. Bar snacks and drinks are served between 3pm and 6pm.